convenient to Potomac, Rockville, Olney, Gaithersburg, parts of Bethesda and Silver Spring. not as far as you think. One minute off Shady Grove Road, fewer than 5 minutes from 270, 370, 355 and 200. As with every Dynamite gym, Dynamite2's mission is to create a safe, nurturing atmosphere where everyone, regardless of age or ability, can be successful. 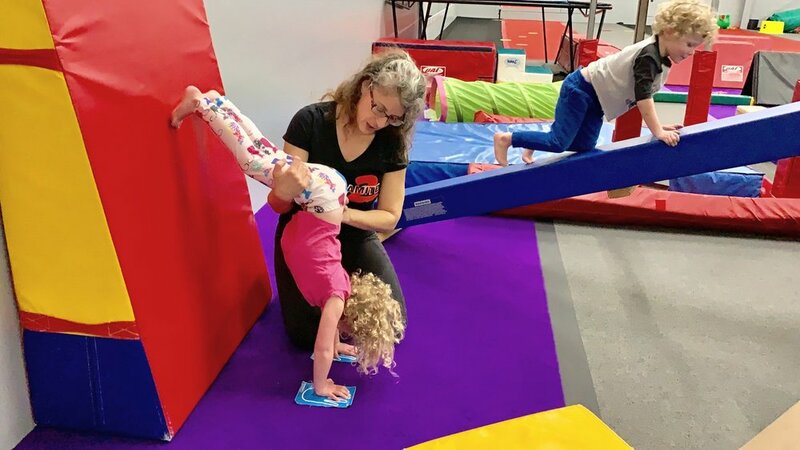 Whether learning basic movement as a preschooler, practicing cartwheels with friends, or preparing for high-level competition, Dynamite students are supported as they work towards their own personal goals while having fun. Allstar Cheer is a combination of stunting, jumping, tumbling, and dance. Students as young as 5 are invited to begin working on fundamental shapes and movements. We offer classes for beginners and advanced athletes. This program is perfect for kids who want to have fun with friends, compete, or develop skills for high school cheerleading. Tumbling, one of three events found in Trampoline & Tumbling (TNT), is rapidly gaining popularity as variations are now implemented in cheer, parkour, dance and other disciplines. 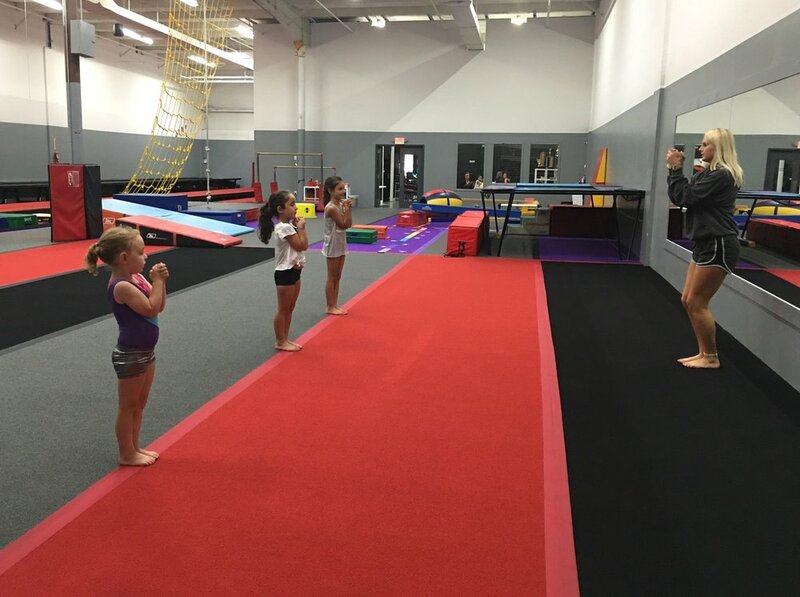 Dynamite starts with the basics--rolls, handstands, cartwheels--and teaches students how to connect these skills and continue building additional elements. Think Simon Biles. Bars, beam, floor and vault comprise Women's Artistic gymnastics. Our curriculum focuses on progressions and proper technique to create a solid foundation in any student. From toddlers developing gross motor skills to teens perfecting bar swings, we are committed to helping our athletes meet their goals. Dynamite specializes in finding the perfect class for every student of any skill level and age (from 6 months old through adults). We break classes out by age because we understand the importance of socialization. As our students grow older, they have an increasing number of programs to choose from, with class offerings seven days a week. Would your child like an entire gym filled with bars, beams, trampolines, and bouncy floors to celebrate his or her special day? Dynamite is the perfect place to romp and play for a full hour followed by cake and refreshments in our party room, goody bags and goodbyes. All you need to bring is a cake--we do the rest! Pick from several packages and options. Looking for something super fun for your kids to do during days off from school and the summer? Bring them to camp at Dynamite for a day of flips, friends and fun. Did we miss a day when school is out and camp should be happening? Give us a call and we will see if we can swing it! If the gym has room and instructors are available, we are happy to set it up. Dynamite's commitment to helping athletes of all ages develop a love of movement while building life skills goes beyond sports. While gymnastics, tumbling and cheer are amazing sports, we know that kids like to try different things. For this reason, and because we strive to have something for everyone, we have several partner gyms that offer a variety of activities for kids and adults. We believe in helping our community. Every month, we help charities through our open gym fundraisers. Each year, we offer scholarships to students with limited means to participate in classes. It's the least we can do to give back to a community that has given us so much.